Hippopotas is a Ground type Pokémon introduced in Generation 4. It is known as the Hippo Pokémon . The effectiveness of each type on Hippopotas. 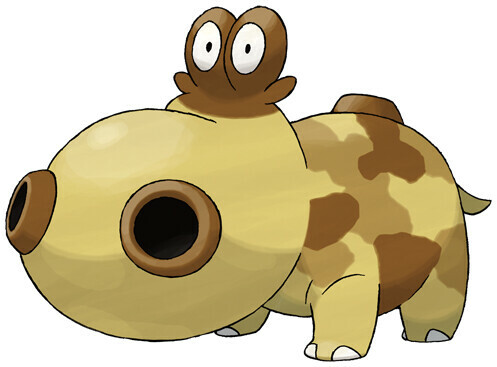 In Generation 4, Hippopotas has a base experience yield of 95. It lives in arid places. Instead of perspiration, it expels grainy sand from its body. It enshrouds itself with sand to protect itself from germs. It does not enjoy getting wet. It shuts its nostrils tight then travels through sand as if walking. They form colonies of around ten. It shrouds itself in sand to ward off germs. It travels easily through the sands of the desert. It shuts its nostrils tight then travels through sand as if walking. They form colonies of around 10. Hippopotas learns the following moves in Pokémon Ultra Sun & Ultra Moon at the levels specified. Hippopotas learns the following moves via breeding in Pokémon Ultra Sun & Ultra Moon. Details and compatible parents can be found on the Hippopotas egg moves page. Hippopotas can only learn these moves in previous generations. It must be taught the moves in the appropriate game and then transferred to Pokémon Ultra Sun & Ultra Moon. Hippopotas learns the following moves in Pokémon Sun & Moon at the levels specified. Hippopotas learns the following moves via breeding in Pokémon Sun & Moon. Details and compatible parents can be found on the Hippopotas egg moves page. Hippopotas can only learn these moves in previous generations. It must be taught the moves in the appropriate game and then transferred to Pokémon Sun & Moon. What tiers can Hippopotas be used in? What tiers can Drought Vulpix, Snover, and Hippopotas be used in?